Oats are gluten-free whole grain and a good source of vitamins, minerals and fiber. It is loaded with antioxidants. Oats helps reduce cholesterol levels and blood sugar levels. As oats is a rich source of fiber, it gives a feeling of fullness and we are less likely to overeat. So oats can help in weight loss also. 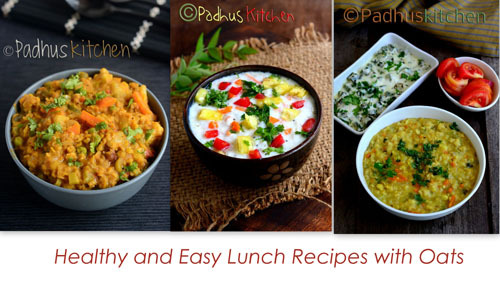 Here are a few collection of oats recipes which you can include in your diet. Find below 30 interesting ways to include Oats in your diet. 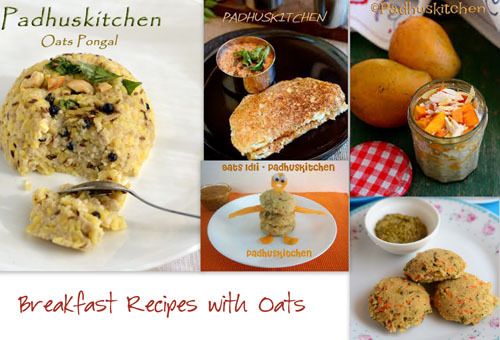 Quick fix breakfast recipes with Oats. Best for school going children also. Add oats to your smoothies and make it more nutritious and filling. Breakfast ideas to make ahead of time to make your mornings less hectic. One of the simplest way to reduce weight and get into shape is to add more fiber to your diet. Oats fits that bill perfectly. Oats is not only rich in fiber and various important vitamins but is also a great source of energy. It can be given as after school snacks for kids and also as tea time snack for adults. I use rolled oats for lunch recipes and quick cooking oats for porridge etc. I got rolled oats from amazon India. You can use any brand.